Spain is just like any other Western country, right? Just mix in some tapas, flamenco, and bullfights, and there you have it, right?. Well, guess again! Other than the aforementioned statement being incredibly insulting, Spain has its own traditions and cultures just like any other country. Of course, there is less of a difference between France and Spain than China and Spain, but we’re not here to argue or offend on that matter. There are just some things you would have no idea to bring when moving to Spain unless you’ve lived here before. Unless you knew some savvy expats – like us! 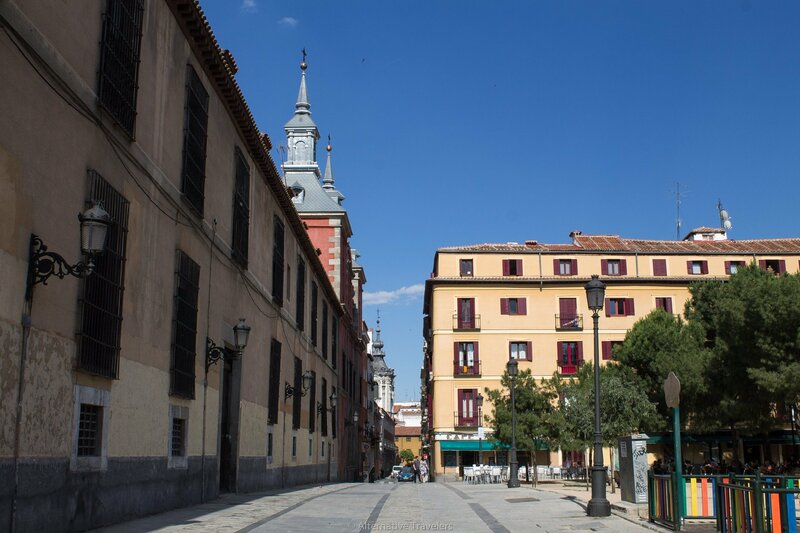 Read more about our Spain journey in three parts: Why We Moved to Madrid, Why We’re Staying in Madrid, and Why We’re Leaving Madrid (For Now). If you’re moving to Spain as an auxiliar aka conversation assistant, read our Auxiliar FAQs article to ease your worries and answer all your questions. While on a short tourist visit you may do fine without these, don’t expect to find anything on this list outside of specialty stores. Many of these items CAN be found, but they will take some searching and when you find them, they’ll be more expensive. However, everything else will be much cheaper than you’re used to. Read our post Cost of Living in Madrid for more details and remember that besides the Basque Country and Barcelona, Madrid is one of the most expensive places in Spain, everywhere else will be even cheaper. However, we wrote this post to help make the transition abroad easier. With all the flurry and stress of moving to another country, even the smallest thing like not finding saline solution can lead to a meltdown. You don’t want to have to worry about these things when you’re looking for an apartment! Once you settle in, you can explore and find what you’re looking for. Just be aware that things will be different, you won’t find your favorite brands, and there will be a smaller selection than you’re used to in consumerist America. So you may be thinking – no worries, I’ll grab it on Amazon when I’m there. Or if it breaks, I’ll replace it online. Think again! Amazon.es is still finding its footing in Spain and consequently is not the norm for Spaniards to order products online. Amazon Spain is NOT the same as Amazon U.S. It’s more expensive and there is a much, much smaller selection. With few exceptions (like European made products), don’t expect to shop online in Spain – do it before you leave. Electronics, in particular, are expensive: expect to pay much more for name brand smartphones and laptops (especially Apple products) when ordering in Spain. Don’t wait to replace your aging electronics until you get to Spain, thinking they’ll be cheaper – it’ll be just the opposite. We’ve looked for particular items we needed to replace and they were several hundred dollars more expensive ordering from Amazon.es vs. Amazon.com. And no, you can’t just order from Amazon.com and ship it to Spain. You’ll get dinged with a big international shipping cost plus probably have to pay even more in customs when it gets to Spain. Just don’t do it. Also, don’t bring any electronics with moving parts that will require a converter. These are items like blenders, hair dryers, high powered mixers, etc. Sure, you can get a converter, but it’ll be crazy expensive and reduce the life of your appliance. Leave these things behind when moving to Spain – besides they take up a ton of space in your luggage. Don’t wait to buy one at the airport where they’re more expensive. This universal power adapter comes with its own handy case. This one is very important. If you’re an iPhone user, you definitely want to make sure that’s running well before you come to Spain, as iPhones are more expensive in Spain (and also much more vulnerable for being pickpocketed). We are both Android users, which are easier and cheaper to buy in Spain. Still, if you want a less common phone, they’ll be much more expensive. For example, Sam looked into getting the Google Pixel 2 while we were in Spain. It was hundreds of euros more expensive than in the U.S. (where people change their phones as often as their clothes, so there are tons of used phones available for cheap). Point being, bring a smartphone you won’t want to replace to Spain. You’ll want something you can get data on, as the main method for communicating in Spain is via WhatsApp (sooo much better than SMS, when is it going to catch on in the U.S.?!). If you need a new phone, we recommend getting a secondhand refurbished one on Amazon. Check prices and current sales here. While you can “jailbreak” your locked phone in Spain (Sam did it), it won’t work unless your phone has the capability of running over European networks. Basically, there are two cellular frequencies worldwide, GSM, and CDMA. Everywhere uses GSM except Verizon and Sprint. So if you bought your phone through one of those carriers, you might not be able to use it abroad. You will need a phone that has the ability to put a new SIM card inside. However, still check with your provider and the stats on your particular phone. More info on CDMA vs GSM here. We actually bought our Kindles in Spain on sale and they were the same price as in the U.S. But we wished we hadn’t waited so long to get them. You can get English books in Spain, either at secondhand bookstores or by ordering online, but if you’re not sure how long you’ll be staying in Spain you might not want to create a whole library that you’ll then have to deal with later. We are obsessed with our Kindles as we’ve read so much more since getting them! If you’re looking for some reading recommendations before the big move, brush up on your Spanish culture and history or read a memoir from an expat that came before you in our 25 Best Books to About Spain to Read Before Your Trip. These are frequent reactions to our anecdotes about Spanish culinary sensibilities. For North Americans, exposure to Latino culture is a part of daily life as there is such a massive population slice that comprises the US. This is due in part to their ancestors already being here when Spain came along and colonized, then sold parcel by parcel to the burgeoning growing USA. So remember, Spain is not Mexico, nor Colombia, nor really Latino at all, don’t expect to find the same foods. Note: You can find some of the following items in the Taste of America grocery stores, which have locations in many major Spanish cities. However, they’ll be crazy expensive since they’re imported! The Spanish, like much of Europe, steadfastly hold onto food traditions. Despite having had one of the largest empires the world had ever seen, they were reluctant to adopt other cuisines. Sure you’ll find some staple foods originating from the Americas (they love potatoes and tomatoes) but even their spiciest traditional dish, patatas bravas, has virtually no heat despite the name of “brave potatoes”. What to Bring: a small bottle of hot sauce, if you can’t part with it – just remember the less than 100ml size for carry-ons. We also suggest a small powdered shaker of spicy seasonings or even buy some and make your own! Also note: the Sriracha that you can find in Spain is (in our experience) different from the formula in the States. If you can’t live without your Sriracha, you might want to bring your own. Pick up a two-pack here. Spaniards love to snack on peanuts. Expect to see them served at bars frequently as an aperitivo (a small free snack), or mixed with other crunchies served right next to your beer. Sometimes they are even seasoned (without spiciness, of course). But don’t you dare expect to see quality peanut butter anywhere. Even health stores known as herbolarios, will only feature one, usually from Scandinavia, at imported prices. Yes, some chain supermarkets may carry a brand, but it’s usually of very poor quality, and nothing like you expect from your gloriously peanut buttered days. Also, literally all of the peanut butter we have found in Spain contains palm oil, which is ruining the habitats of orangutans and is best avoided. We love the Santa Cruz brand because it comes in a glass jar (not plastic and can be reused) and doesn’t contain palm oil. It’s literally just peanuts and a bit of salt. What to Bring: If you’re checking a bag, just bring any jar size you like. However, as a carry-on, peanut butter counts as a liquid (as Veren learned once as his half-filled jar was confiscated), so no size bigger than 100ml, about 2.5 ounces. Planning to bake abroad in Spain? Plan an alternative. Traditionally, all forms of baking are covered by the many specialty shops that are ubiquitous, affordable and expected in Spain. Virtually every block has a panadería (bread bakery), pastelería (pastels, pastries, cookies, crunchies), and/or churrería (mostly just fried sweets like the famous churro). With these being the norm, why go to the trouble to shop and stock your pantry and bake? Sure, some people and families may bake, but you don’t need to – that’s the difference. So don’t expect a baking aisle in the supermarket like you may be used to. If there are baking supplies, expect the bare minimum, and no variety. Meaning one flour, one baking powder, one of everything, etc (with very few exceptions). This is starting to change, and Spanish supermarket Mercadona now carries various flours, baking soda, and more. Exciting! Still, depending on where you’re living, it might be harder to find certain things that you might need if you are a serious baker. FYI: if you’re in Madrid, you can find many of these ingredients at the various bulk stores, which we discuss in depth in our book, the Alternative Traveler’s Vegan Guidebook to Madrid. What to Bring: well, we can’t expect you to bring a whole suitcase of baking supplies unless that’s your thing. So make sure to pack those smaller amounts of key ingredients, like cream of tartar, double acting baking powder, pure vanilla extract (you’ll find imitation vanilla and we all know that’s not the same), etc. Any special tools like a crimper, primper, grabber, whisker, etc. Again, you can get some of these things at Taste of America or larger supermarkets, but they’ll be pricey. Layers!! Layers are your friend in Spain. The temperature can vary drastically in a day, depending on if the sun is out or not. We aren’t big clothes shoppers, so we can’t comment too much on the intricacies of clothes shopping in Spain vs. other countries like the U.K. and the U.S. However, expect international brands to be more expensive here. If you must have your Levi’s, they’ll cost you more in Spain. Often when Spaniards go to the U.S., they bring back brand name clothes because they can get it much cheaper in the U.S. thanks to rampant American consumer culture. Spain has its own fashion trends and styles, so don’t expect to find your usual clothes here, even in international chains like H&M. These stores will tailor their stock to the local populace based on what sells well. And here, Spaniards love logo tees and just sporting brand names as much as possible. They dress very much to the seasons as well. If you love to shop secondhand or at thrift stores, be aware that the selection in Spain is not what you’re used to in the U.S. or the UK. There are some independent charity shops but they are few and far between and with a poor selection. There is a chain of second-hand stores called Humana, which is your best bet. However, there’s been some recent allegations that the owner was doing some shady things with the proceeds, so proceed with caution. Spain is not perpetual sun and warmth – it has seasons, including a mild winter. But a mild winter still gets cold. And often, with arid climates, nights can get quite cool as well. We will even bring a hoodie out with us in May, as we know once the sun sets, if there’s a bit of a wind, we’ll be glad we brought the extra layer. For an in-depth look, check out our article: What to wear in Winter in Spain. Actual image of Veren in Madrid’s winter. While you will see that farmacias (pharmacies) are widely distributed over every block, that doesn’t mean you’ll find the selection you’re used to in American ones. Even combined with the herbolarios (health stores that also sell food), over the counter options are limited and sometimes damn expensive (as opposed to prescription drugs which are insanely cheap and put the USA to serious shame). If you use any kind of specific product, or even if you buy the typically available US stock, it’s possible you may not find what you’re used to in Spain. Yes, you can obviously find chapstick. But only if you’re into a 30 plus ingredient list that you could only remember one-fourth of and don’t even know what the rest is. If you’re looking for natural chapstick, even the herbolarios don’t carry anything with less than 10 ingredients. One exception may be vegan stores, but other than that, you’ll be out of luck. The natural ones you do find will be super expensive. What to Bring: natural long-lasting SPF protection lip protector. For those of us who prefer a non-addictive sleep aid, melatonin is God’s natural (and legal) gift to these mildly sleep challenged. However, the options for melatonin in Spain are rare outside farmacias, exorbitantly expensive, and if they do exist, high dosage (like 10 milligrams – that’s what it takes to make a Spaniard sleep). What to Bring: a dosage of your choice, with a travel-friendly amount. Pills work best – capsules often have gelatin. We get the Trader Joe’s ones because they aren’t a crazy high dosage like most brands. Another surprising lack, as Veren has spent so much time searching for a bulk amount of earplugs, not just individually and excessively plastic contained or wrapped pairs. Expect to dole out a couple euros for a pair – we don’t know why. And even in the biggest of farmacias, we couldn’t find any foam earplugs, just these awful cotton covered wax balls that you can mold with your finger. While that may sound fun, they’re not breathable like foam, and you’ll wake up with sweaty ear canals. What to Bring Instead: there are many options online for earplugs, and we suggest, if you are a regular user, to either use reusable earplugs or at least buy bulk in a container. Ask a question about deodorant in any expats in Spain Facebook group, and you’ll be sure to start a firestorm. Who knew deodorant was so divisive? In our experience, deodorant in Spain isn’t the same as what we’ve got in the U.S. Virtually all deodorants are spray and do not work at all. If you can find a roll-on or stick deodorant, it also does not work. Probably has to do with all the strong chemicals that get put into American deodorants. Anyway, before we started making our own low waste and natural deodorant, we always used to bring back some deodorants with us. Ok, so we don’t care much about this one. Sam wears eyeliner and that’s it. We wash our faces with water and have great skin (cutting out dairy was LIFE/SKIN CHANGING for both of us but that’s the topic of another post). However, it’s a common complaint we hear on forums and from visitors. So if you can’t live without your St. Ives face scrub or that particular brand and shade of foundation, you’re best bringing a couple of bottles with you. If you can find it in Spain, you can bet it’ll be twice as expensive. Above all, Bring Flexibility and Patience! The number one thing you should bring with you when moving to Spain is an open mind and a flexible attitude. You’re moving to another country, so don’t expect things to be the same as you’re used to. That’s part of the adventure, after all! Fellow expats – anything other recommendations for things to bring when moving to Spain? Let us know in the comments!